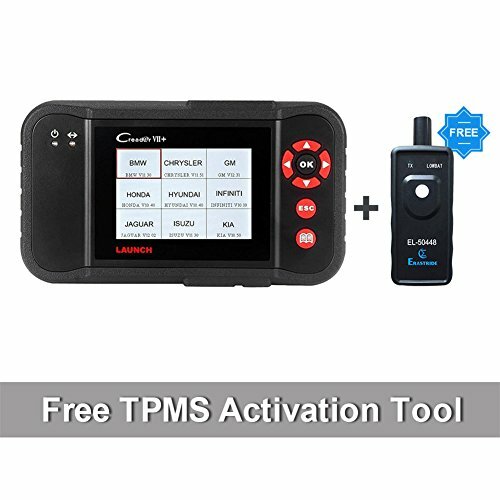 CREADER VII PLUS + FREE TPMS RESET TOOL - While this scanner will detect and correct problems in your car, it also allows you to playback the data so you can know what the anomaly is and in the process generate data that might prove helpful in the future. MAIN FUNCTIONS - Test,read and clear codes on fours systems- Engine, Transmission, ABS and Airbag four systems,displays data stream graphic, stores and playbacks dynamic data stream for quick analysis and diagnosis;Please noted TPMS tire pressure sensor on models in & after 2012 can be read, only with some specified diagnostic tools. BROAD COVERAGE OF CAR MODELS - Suitable for most vehicles with OBDII standard after 1996,covering 30 main car models in America, Europe and Asia Pacific regionsAsian car models: Suzuki, Honda, Mitsubishi, Nissan, Toyota, Mazda, Hyundai, Kia, Subaru, Infiniti, Lexus, Accura, Isuzu.USA car models: Ford, GM, Chrysler.European car models: Benz, BMW, VW, Opel, Volvo, Fiat, Landrover, Seat, Skoda, Audi, Porsche, Saab, Jagua. CONVENIENT UPDATE VIA PC - Updating software can be downloaded from website: mycar dot x431 dot com, which is only compatible with PC with Windows XP,Windows 7, Windows 8 (32Bit), Windows 10 system (32Bit), Not compatible with IOS system; Easy to read with multilingual menu, including Chinese,English,French,Spanish.